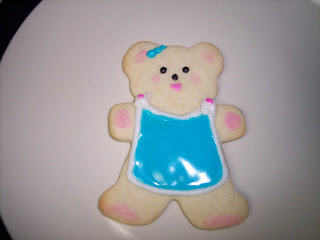 I think that is enough proof that I won't be doing decorated cookies for any further birthday celebrations. The new catalogs arrived all shiny, heavy, and new on my doorstep last night. The catalog is laid out beautifully and you are going to LOVE all the new products. I can't wait for my Catalog Kick-off Party in July. I'll keep you updated on the details. I have to go snuggle up with my son and catalog now! Sweet new stamps - Not flowers! The new catalog should be here THIS WEEK!!! Of course, the ETA is either Friday or Saturday - which will be either on the day of my daughter's birthday party or on the day of her actual third birthday. I hope she takes a LONG nap, because Mama's gotta see the new pretties!! 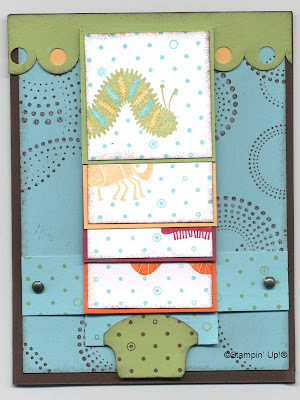 Here is another 3x3 card using one of the new sets, Year after Year. (Yes, I tore myself away from my Pick a Petal to play with a different set!) 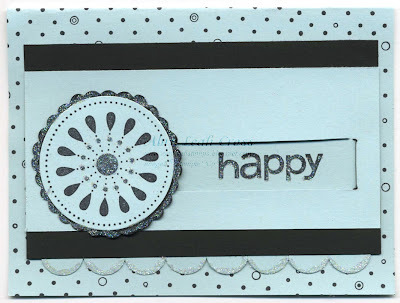 It's an 8-stamp set that is going to be great for folks who want to make sets of gift cards for people (think Tags and More, only cuter! 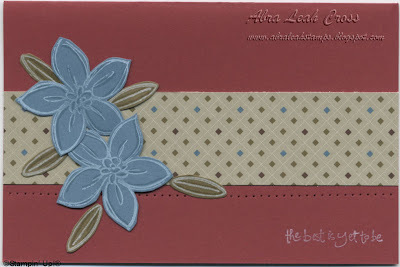 ), for people who like big tags, and for people like me who like one-size-fits-all stamp sets! I love sets that can be used for more than one occasion, and this is definitely one of them. 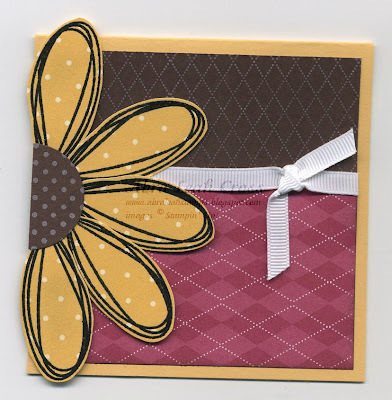 I am having so much fun with the Pick a Petal stamp set! 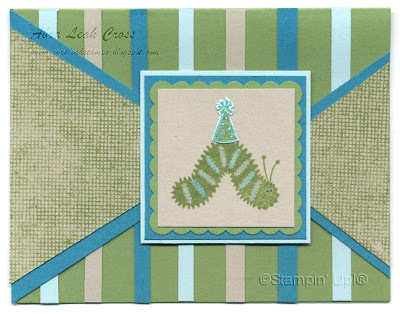 Here's another easy 4x4 card that really pops with the Palette o' Prints designer paper (there will be SO many more colors to choose from in the Fall-Winter catalog, I can't wait to see them!). 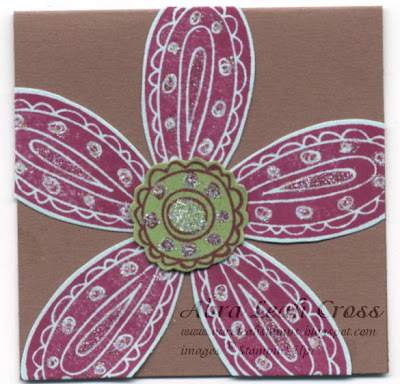 Glitter, new paper, and scallops, Oh my! 06-07 In Colors will soon be gone! I really do love the new 07-08 In Colors (check them out in my June newsletter), but I am going to miss the 06-07 ones! Especially Cool Caribbean - I bought 4 packages of paper because I know I'm going to want it later when it's not available!! I already have all the ink refills (for the markers I made), so I think I'm set. As the 06-07 In Colors are retired, the Simply Scrappin' Kits that used them will certainly be retired as well. 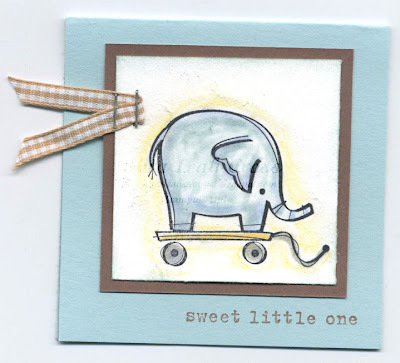 I made this simple card using designer paper and card stock from the kit, Tickets and Tokens. It's also my first attempt at watermarking...I have a lot more to learn! This is my first attempt at a waterfall card. Email me if you'd like instructions for making your own! I'd love to see your creations, so send me a picture if you decide to make one. I'm working on a newsletter for my customers (and anyone who is interested!) - the first issue is available now, just click the link below. Let me know what you think! !